The HJC2 comes with an enhanced refrigeration system with CoolSmart controller for increased energy efficiency - saving up to 15% on energy costs. It is also manufactured to international quality standards for reliability and performance - HACCP compliant. Tough Stainless Steel exterior and interior base with durable aluminium interior. Easy to adjust removable shelving, racking, supports and drawers. Lockable, self-closing doors with magnetic balloon gaskets. Heavy Duty swivel and brake castors - non-marking, easy to position. Stain resistant coated shelving - longer life, easy to clean. Stylish Design, moulded handles and sleek stainless finish. 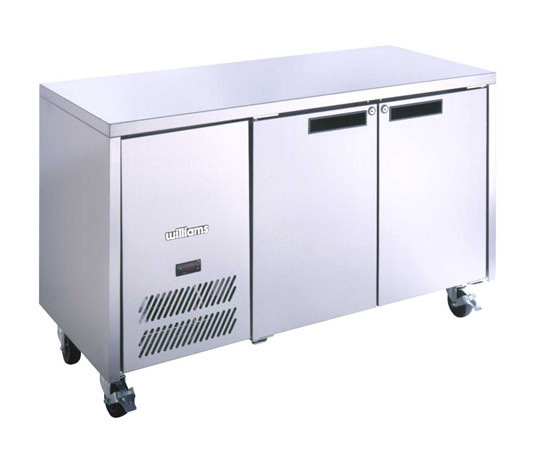 Top mounted removable, forced air refrigeration for easy servicing and maintenance - removable cassette for counter models. Adjustable operating temperature for maximum effectiveness, even in the hottest environments. 220/240V 50Hz Single phase unit complete with fitted plug. Standard price is Parts only for 1 year. Parts & Labour is an additional cost. More products in Counter Fridges. For enhanced temperature management, these cabinets are compatible with a wide range of temperature monitoring and control systems.